Grand & impressive is the feeling when in the presence of our elegant 8' & 10' Grande. 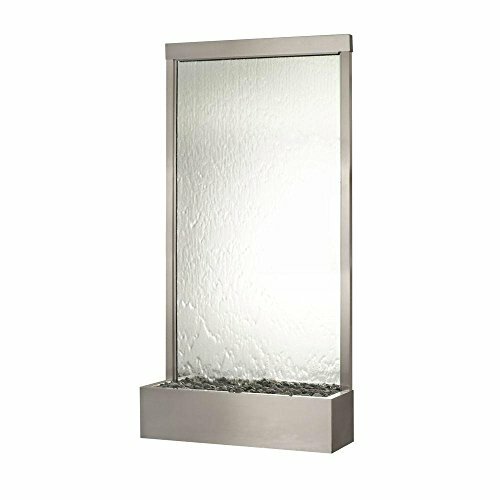 Shown in modern brushed stainless steel with silver mirror, these stately water features present a virtual wall of flowing water that will relax & give visual pleasure. If you choose white glove delivery service, the fountain will be placed, fully assembled, right where you want it. Please contact our Sales department for a quote on white glove delivery. You can also have the water feature delivered for free with standard ltl freight shipping. The fountain will arrive with everything you need - from the filter to the rocks. Within Min & in just a few quick steps, set-up will be Complete & you will be basking in the water fountain's calm, peaceful atmosphere. Water fountains like this are more than just decoration; they are a gentle retreat from a hectic world. The plumbing or water disbursement system on these Floor fountains is covered by the header cap. The header is easily removed by lifting straight up & off the unit. Removing the header for the 8' (94") & 10' (118") grandees will require a minimum of 5 additional" of clearance beyond the overall height of the fountain. It is necessary to have access to the plumbing for regular maintenance & flow adjustment when needed. Please make certain you understand the height requirements for these units. It may be necessary to measure the ceiling height in the proposed space to be certain it can accommodate the extra space needed to remove the header cap. View More In Floor-Standing Fountains. If you have any questions about this product by BluWorld, contact us by completing and submitting the form below. If you are looking for a specif part number, please include it with your message. © 2019 - themalaysianmirror.com. All Rights Reserved.